Sometimes the Zinnias Attract Butterflies! It's autumn! It's time to save those Zinnia seeds from the plants you've been enjoying all summer. 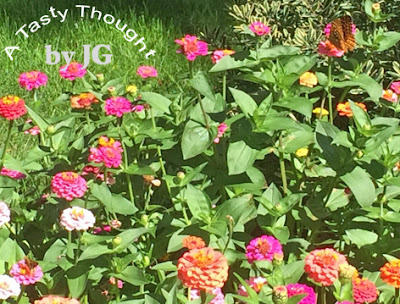 You know you'll want to enjoy these beautiful colorful flowers again next summer. So, save the seeds from this year's crop and plant them in your flower garden next spring! In other works, it's time to plan ahead. Before we get a frost this autumn I harvest the colorful flowers (no stems). That frost will end my Zinnia crop! Place the flowers in a cut down tissue box. Then, place the box in front of a window to dry them out. 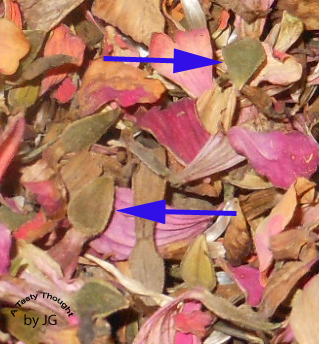 After the flowers have dried, pull off the outer petals. No longer are the petals colorful, but dried out. Each petal is attached to a "tear shaped" seed. Those seeds are a gold mine of new plants for next year! The red, the orange, the pink and the yellow flowers! Save the seeds in an envelope for next year. I always seal it, so none fall out. Next spring, take out your envelope of seeds! You will be so happy that you saved those seeds! Find their spot in your garden & plant them in the warm soil. Cover with a light coating of soil. Water. Before you know it sprouts will pop up & your new Zinnias will be on their way! This is a tradition with me! After perhaps 5 years the flowers start becoming a little smaller. Then, I know it is time to purchase the seed packets to plant. Until then, I'll be saving my colorful Zinnia seeds! Who would guess that under the crushed "hint of salt" Ritz crackers is a light covering of shredded cheese & Parsley flakes? Under that is an individual sized portion of Haddock or Cod. There's also the light sprinkling of Parsley, Paprika & Basil on the fish. 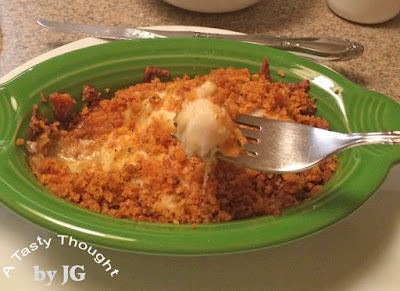 Baked Haddock Casserole! This is such a delicious entree! My Fiestaware individual sized casserole dishes are perfect for baking this yummy seafood. It can be prepared any time during the year using fresh or defrosted Haddock. We've enjoyed this at dinner so many times during the past year. Last summer when we were at the Cape (Cape Cod in MA) we stopped in for dinner at a favorite restaurant in Orleans, MA- Rock Harbor Grill. At dinner that evening we had a yummy baked fish entree, only it contained sausage in the topping. Considering that I am watching my cholesterol, I decided to make a similar dish at home minus the sausage. I add Paprika for the extra kick here. To be honest, I do not see a difference in taste. The fish is light & moist in this casserole. The cheese & herbs give it a great taste. It has become one of our favorite dinners on a cold New England night. Bake this entree some evening! It is so good! Rinse Haddock under cool running water. Then, sprinkle on Paprika & Basil. 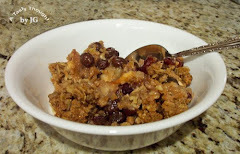 In a small bowl combine crushed Ritz Crackers OR Bread Crumbs & Garlic Powder. Add melted Butter/ Margarine & Worcestershire Sauce. Combine well. Spread half of Mixture Topping on top of each baking dish. I find the crushed Ritz crackers work well here as do the Bread Crumbs, so I use either. This entree is just delicious! There's no need to enjoy it only at a restaurant! Serve it at home with a Salad & a Baked Potato! O.K., I admit it! I wrote this post for me. That's right. 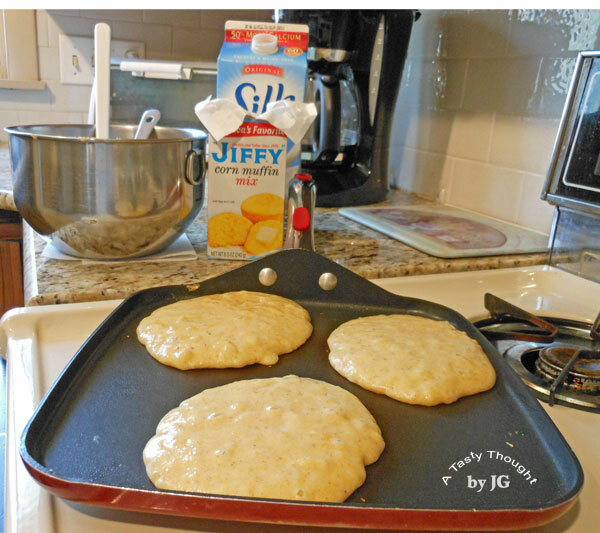 Banana Cornmeal Pancakes are so easy to prepare- especially if you use a box of "Jiffy" Corn Muffin Mix. That is one of the few "mixes" that I use when baking/ cooking. It's probably totally comfort food for me. Growing up my mom always used this mix for Cornmeal Muffins. Now, I use this mix for pancakes that are banana flavored. In the past the recipe for the Cornmeal Pancakes was printed on the box. However, times have changed. It's no longer visible- at all. So, I always google to locate it. I always seem to forget the amount of Milk needed. For this reason I am writing this post! For me & also for all of you who just may try it! 2 Egg Whites for 1 Whole Egg. Olive Oil for sauteing & baking for melted shortening. Combine mashed Banana & beaten Egg Whites. Add Soy Milk + Olive Oil. Combine with 1 pkg. Jiffy Corn Muffin Mix. Stir well. Use about 1/2 cup batter for each pancake, more if desired. Place batter on hot griddle, turning over when brown. This morning we enjoyed this pancakes. When I prep them again, I will not need to google the amount of Milk! Woohoo! The extra pancakes??? Oh, I always freeze them. Place in a sandwich bag & then in a Ziploc Freezer Bag. Label/ date & freeze. They are so tasty on a busy morning- after heating in the microwave!